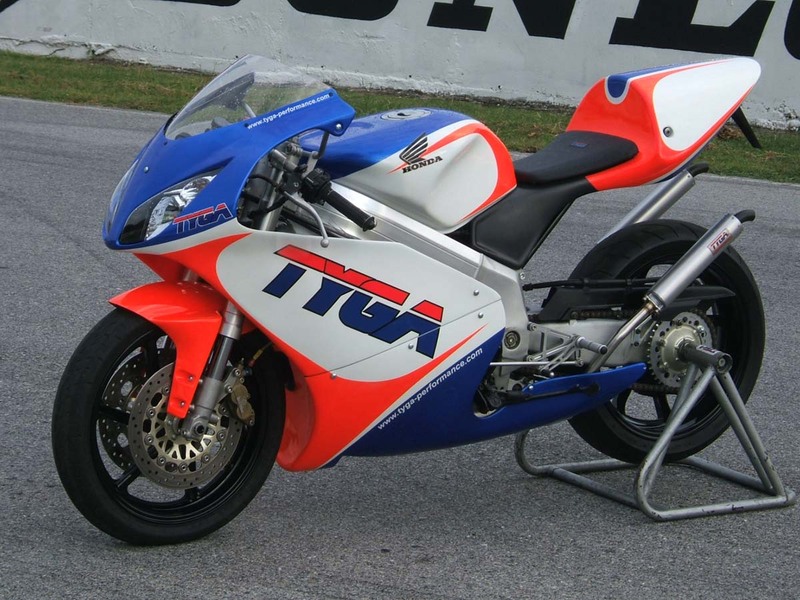 It may seem like TYGA has neglected the NSR250 and focused our efforts on the V4 Hondas. 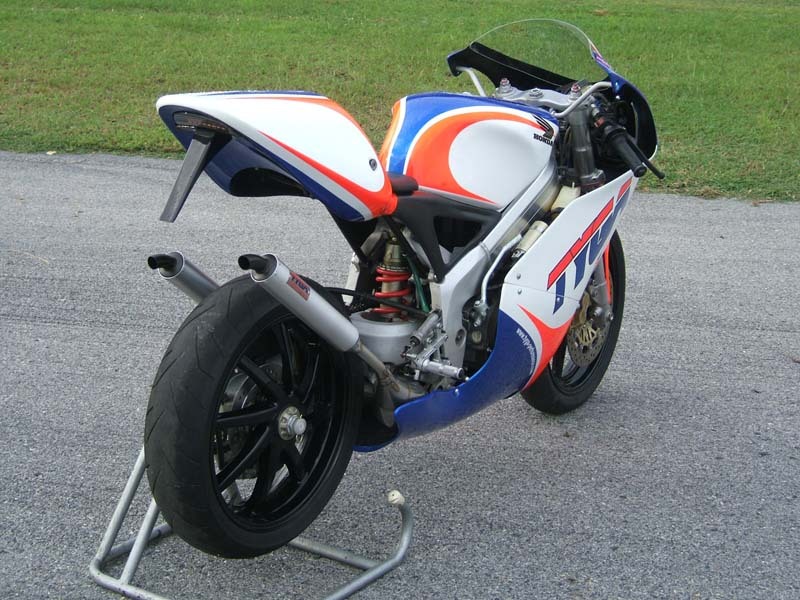 Admittedly, the last two projects have been 400s but we have been working on improving our existing NSR250 parts as well as launching a new bodywork style and so it is time to showcase this on some bikes and this page shows one such project. The model chosen for this project is the ever popular MC21. The rational being that this model is the most numerous and easiest to deristrict. 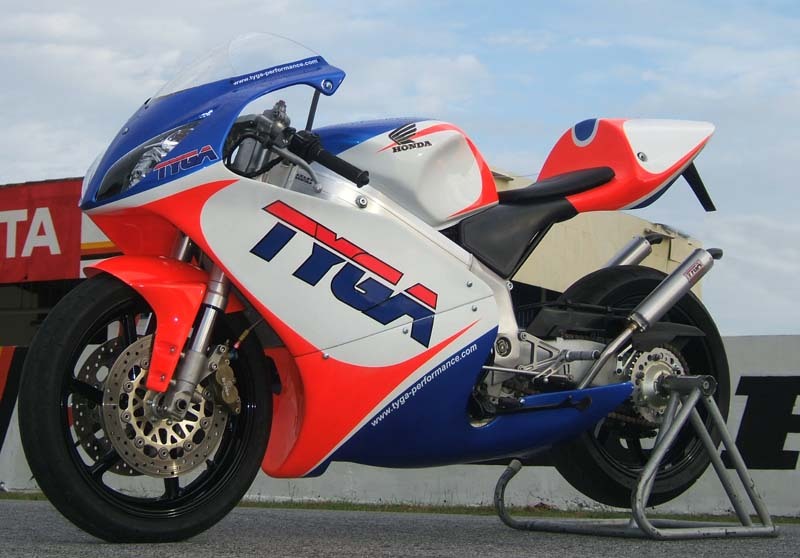 However, as the pictures show, even an NSR 'anorak' would be forgiven for assuming the bike started out life as an MC28. 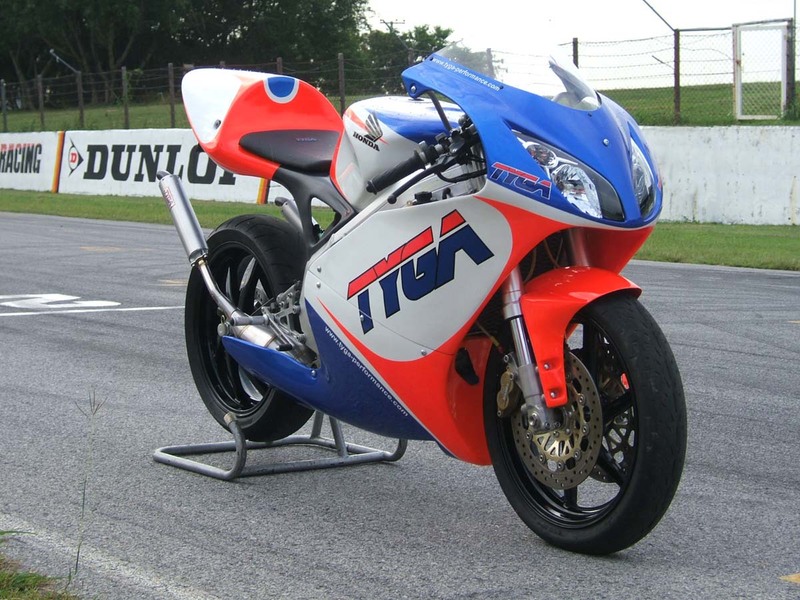 The rolling chassis features different suspension components and just to confuse things further, the keen eyed would notice the tank is MC28 and all bodywork, exhausts and steps are all TYGA Performance Products, so stylingwise it has had a total update. 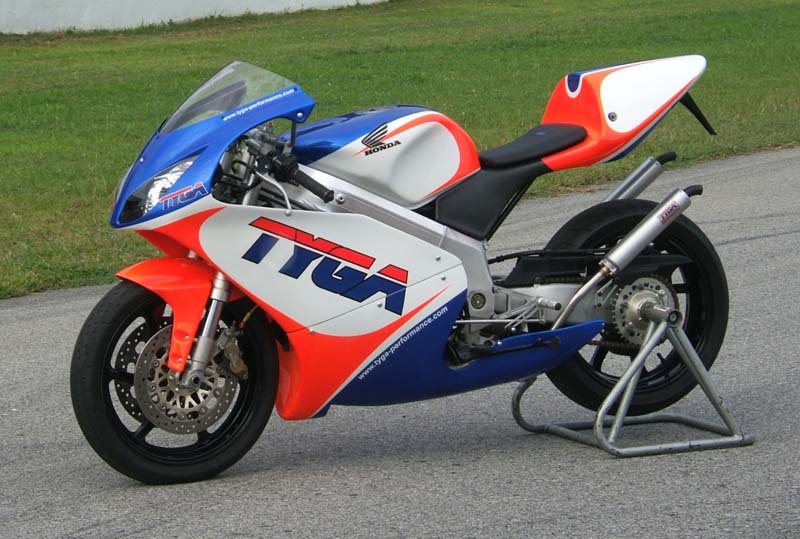 Technically, the NSR has been given considerably more power than in its previous life. 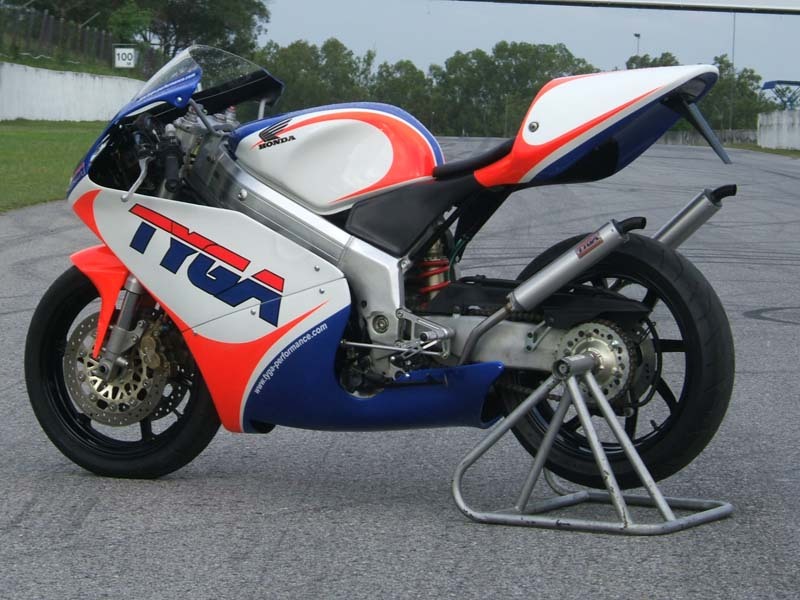 The bike is fitted with a TYGA Performance 300cc big bore kit and together with Tyga expansion chambers and other components of the power up kit, power is raised from the stock claimed 45 to over 70 horsepower with a stomping mid range to boot compared to the stock engine. So, this bike delivers as well as looks the part. 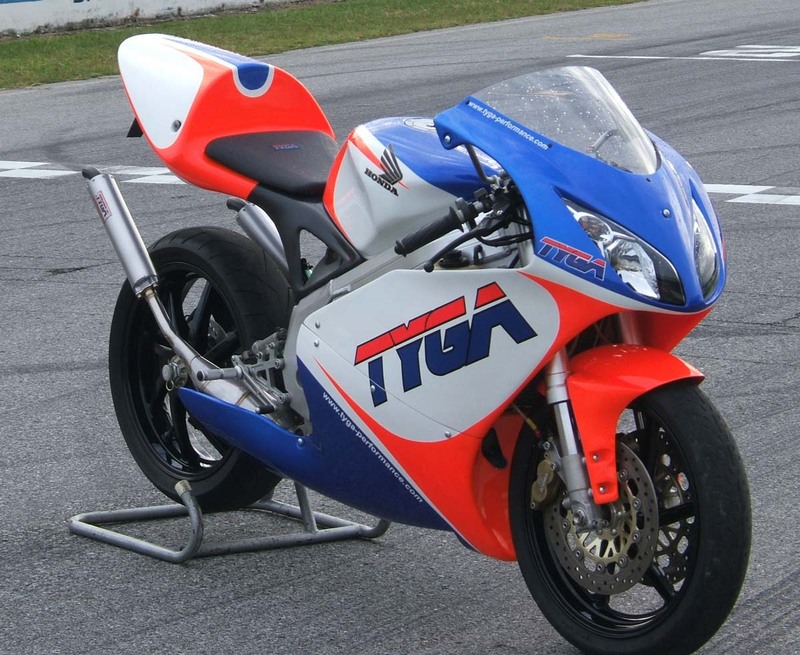 Bodywork is all Tyga as you'd expect and consists of the latest version of the popular GP Race Tail. This is now made from both glass and carbon fiber crossweave mat. The benefits are lightweight combines with enhanced looks without the prohibitive costs that an all carbon unit would entail. We now lay up carbon on the front section of the seat cowling and leave it on show, while the glass part on the rest of the panel is painted over in body color. The registration holder is now carbon finish too for strength, lightweight, and of course looks. 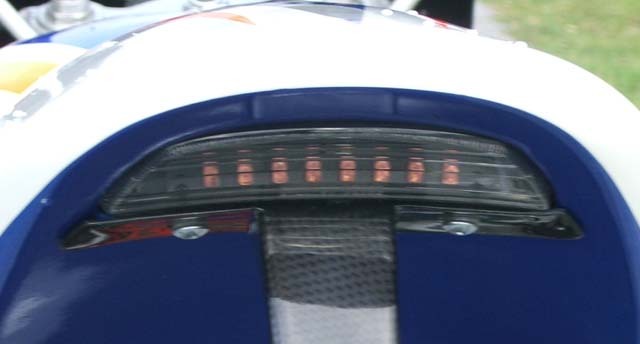 The latest version of our LED tail light fits neatly in the underside of the seat cowling and can be fitted either with or without the registration holder. 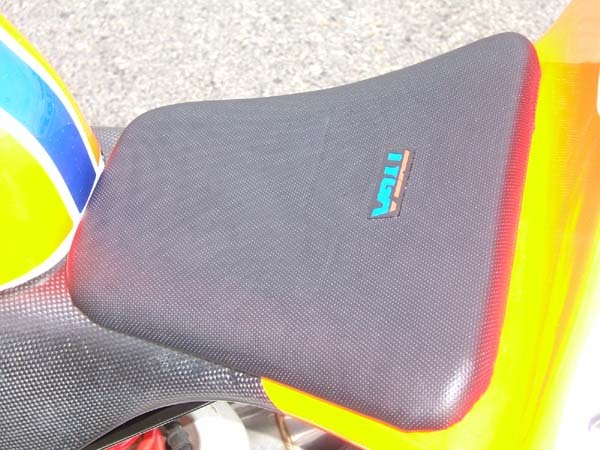 To complete our upgrade of the GP Race seat, we have a new version of our seat pad which is now attached by Velcro strips. It is now a simple five minute job to fit the seat pad to the cowling. 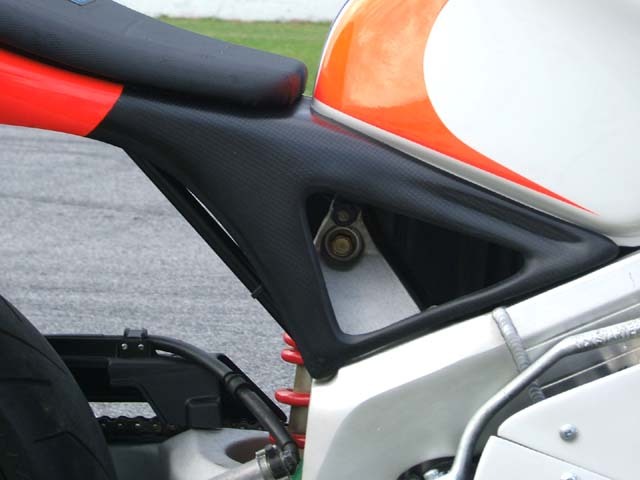 Unlike the glued version which was more messy to fit and difficult to locate exactly in position, this seat pad can be removed and replaced which is particularly handy for removal of the rear tank position hidden under the seat pad. Just to finish it off, it has a high quality fabric finish and our logo embossed in it. 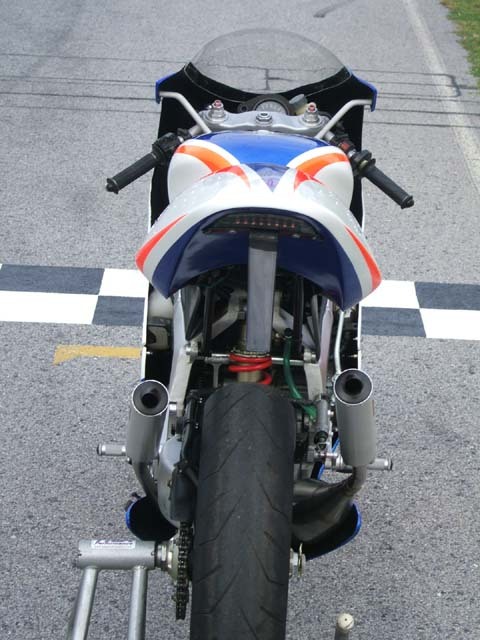 Moving to the front fairing, this consists of our RSW style fairings. 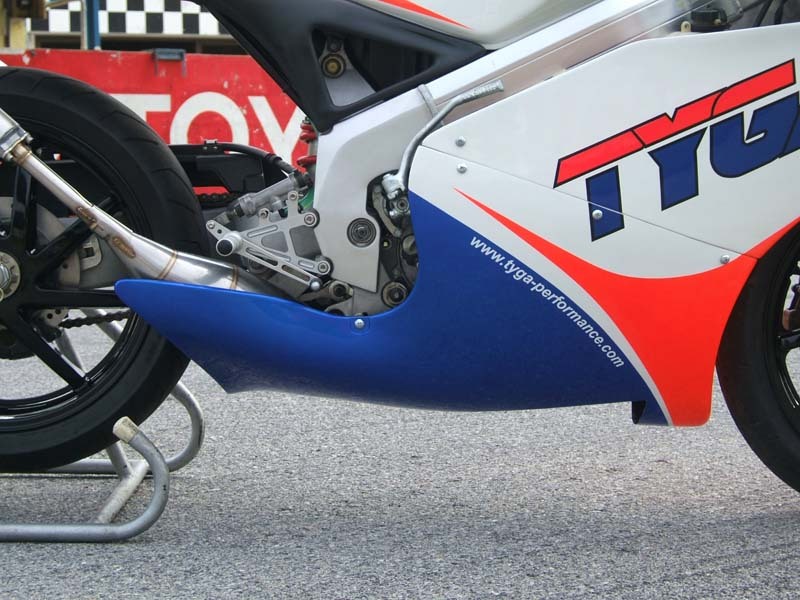 Well, as you can see this is modelled very closely on the 2004 RS250RW fairing as used by GP250 champion Danny Pedrosa. 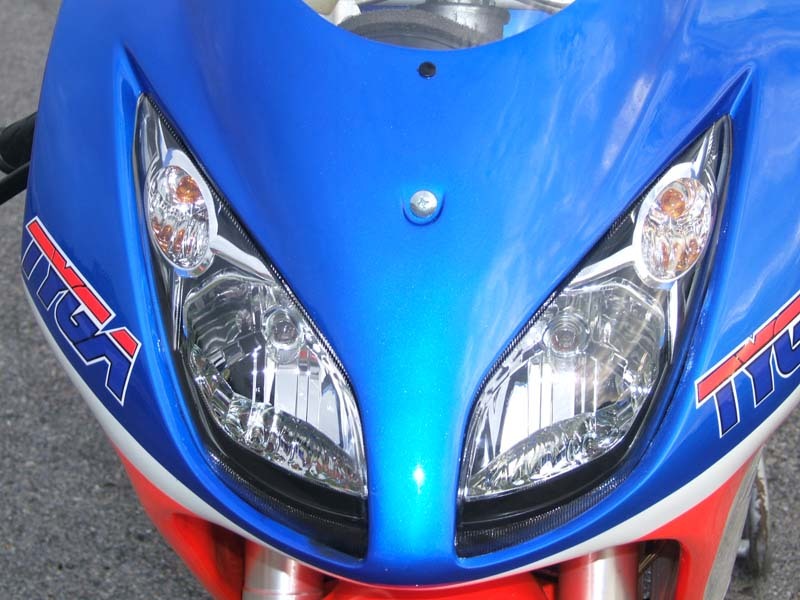 Unlike Danny, most of our customers require some sort of night time visibility, so the fairing features our Tyga Eyes II headlight which has integrated turn signals to give a modern and clean appearance to the front. 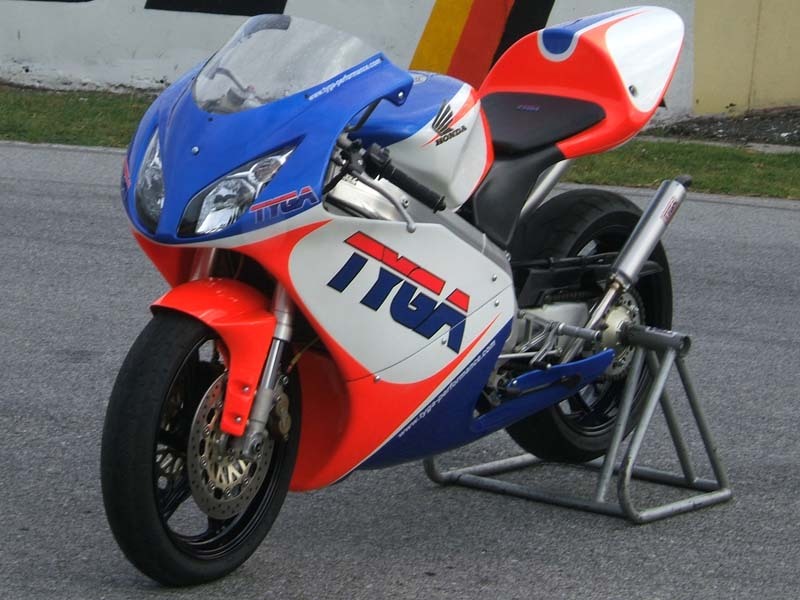 Visibility is more than adequate and is a vast improvement over the GP250 unit as would be expected. 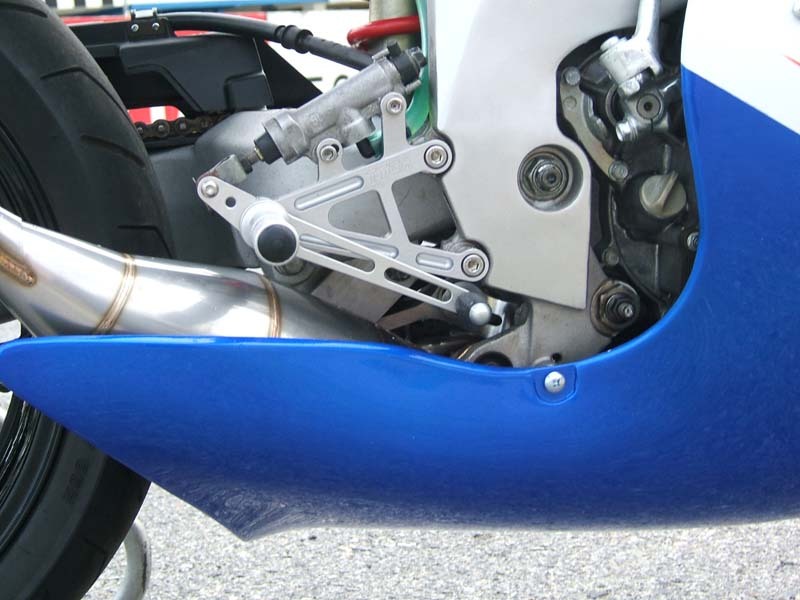 The RSW lower cowling has many improvements over previous ones; it retains the GP lower vent but also has a flip at the rear wheel position. 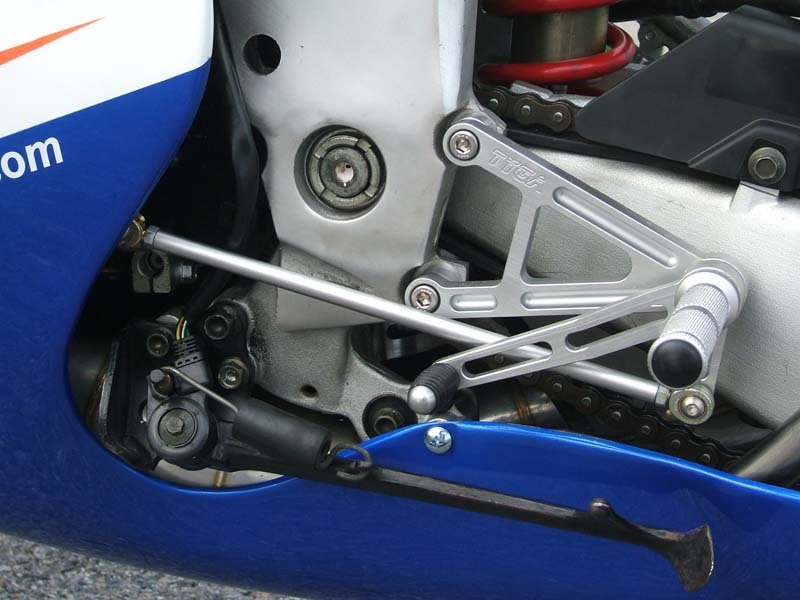 In addition, careful attention was given in the design to maximise ground clearance with the bike banked over and the panel fits very snuggly around the lower portion of the bike allowing for sidestand clearance as well as sufficient space for the chambers. Like the other panels, the lower is super lightweight and strong using epoxy resins for superior durability. We haven't measured it, but the difference between stock plastic and this set must be several kgs. 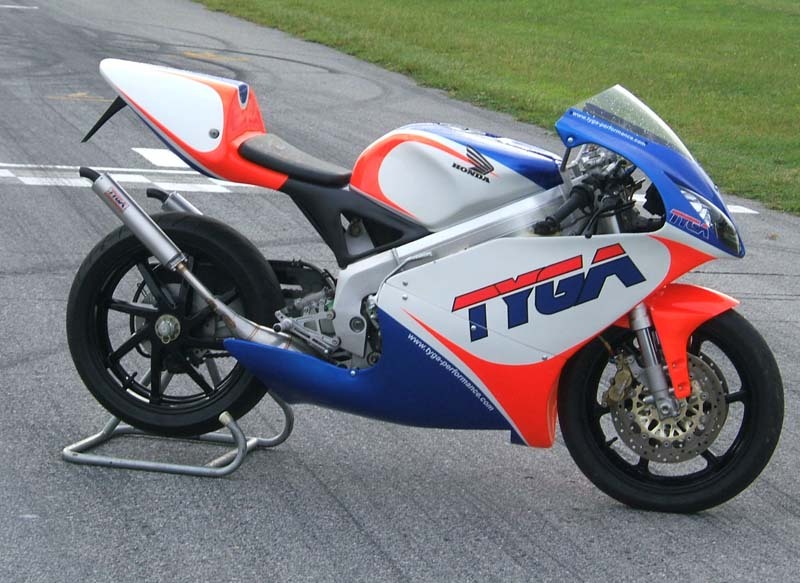 Front fender is RS250 made by Tyga to match the front end and to finish off the painted parts, tank is an MC28 unit as previously mentioned. Why? Well, just because we like the shape really and we can! 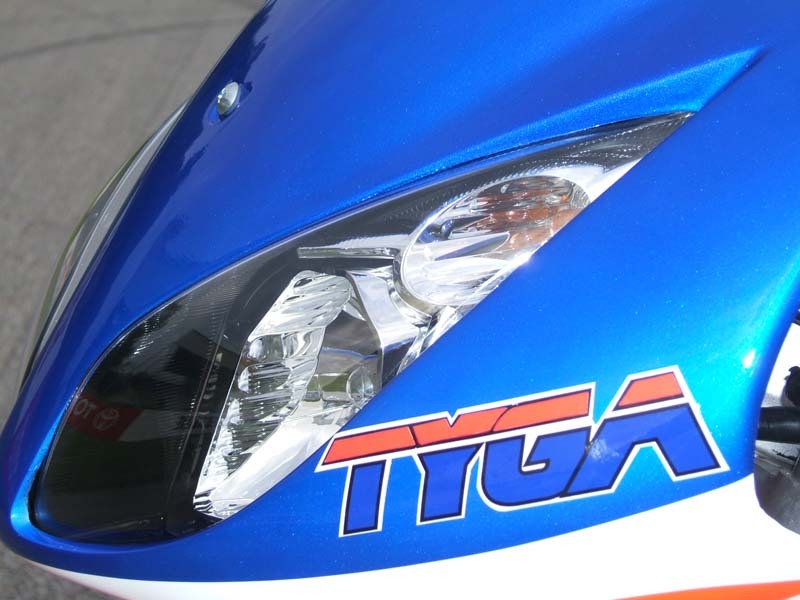 Finally, a word should be given to the paintwork which is our latest rendition of the Tyga Paint scheme. We were thinking of an update for this year but in the end settled for a color change only which is not so discernable on the screen but much more so in real life. We painted the red in fluorescent paint to make the scheme really stand out and it certainly does! 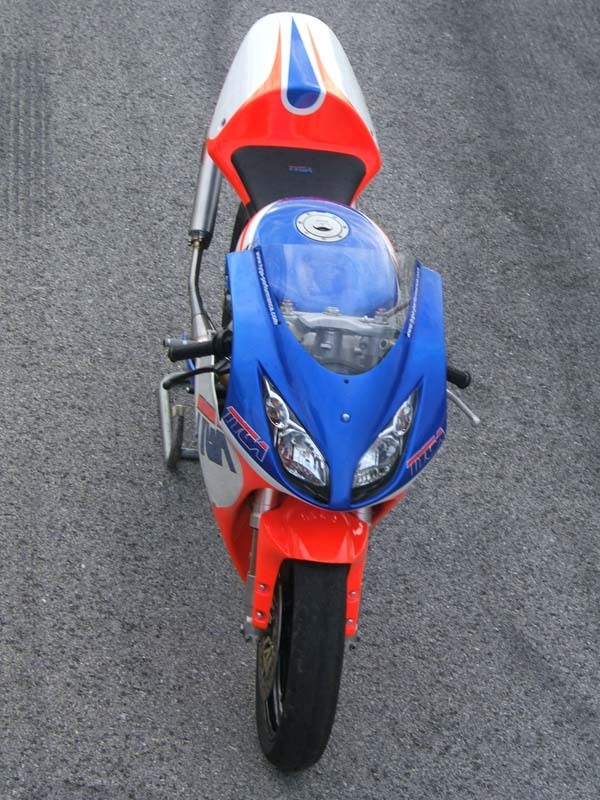 The shape of the fairing suits the scheme well and we are more than happy with the results. Parts used in this project can be purchased from our website store. Hi Flo reeds, MC21/MC28, Assy.